And with that, I'll bid you adieu. Watford can focus on the short trip to Wembley next month, while Palace will concentrate on the league. Thanks for looking in, but keep in touch with all the other FA Cup ties across the BBC! For a full rundown of today's action, take a look at Matt Bullin's match report. But supersub Andre Gray put Watford back ahead just two minutes after coming on. Palace hit back through Michy Batshuayi after a mistake from Adrian Mariappa. Etienne Capoue finished smartly to give Watford the lead. “Every time you get to the quarter finals and you are that close to Wembley and you don’t win it is an opportunity missed, but I can’t criticise my players through a lack of effort or desire. It was always going to be tight and I thought we made a really good effort, especially in the second half. “Safety has always been the main goal, the FA Cup has been a very nice bonus and we are disappointed we couldn’t take it further. But we never made any bones about the most important thing being keeping our place in the league and making certain we get the points we need. “It was a close game, once again a game at this stage of the season affected by conditions - the wind was difficult, and you can’t get ball down on ground as much. At half-time there wasn’t much to say - they had a lot of corners and used the wind to their advantage. “In the second half we played a lot better, got a deserved equaliser and we were looking like it could be us to get the second goal. But, it was the opposite, a good goal from Gray wins it for Watford. “I don’t either side could say ‘it was our game’, it was fairly even, and it has been like that in all three games against Watford - all decided by a special moment or something that has happened that you can’t legislate for. Either team could have gone on to win." "I don’t know what happens in the next games but Heurelho Gomes is very important - playing, not playing, his experience and attitude every. After the game I wanted to recognise his important role this season. "We have eight games more Premier League games this season and the semi-final so we will see what happens. "It is the moment to enjoy it but we are ambitious. We want to achieve the final, that is our target and to enjoy the semi-final in Wembley." Palace manager Roy Hodgson has been lamenting his side's fortunes - we'll have full reaction from him soon. "It is amazing for all of us, for the players, staff and supporters. It is an important day to have the chance to enjoy a semi-final, we are keeping the same level, competing well and that it is our target in this moment. "It was a difficult moment (when Crystal Palace equalised), a mistake when we conceded but I was confident we would be able to win the game. We put Andre Gray on the pitch, he always has a good chance to score and scores important goals for the team, he deserves it and I am happy for him. "There are other players working hard from the beginning but when he plays he shows me his quality and is scoring important goals. We have different options and all of them are ready to compete well." “Sensational - I couldn’t ask for more. That’s what I asked from the boys before kick off, it is a big opportunity for us in the cup that we can keep going. Game by game when we start to play in this cup, I said this is special so why not dream about it? It was amazing today. “It was emotional to be honest, it has been a great five years here. I am 99% sure I will retire at the end of the season but still 1% I haven’t decided, but that is what I planned for from two or three years ago. I am 38, so I think it is the end of my career here. “This club has been amazing, they gave me the opportunity to dream again when I planned to go back to Brazil in 2014. It has been an amazing five years but we have to think about this after the season. And check out those snazzy gloves! The FA Cup quarters? We've got it covered! This weekend's FA Cup quarter-finals include two live matches on BBC One, including Manchester United's visit to Wolverhampton Wanderers on Saturday. Build-up from Molineux starts at 19:30 GMT, with kick-off at 19:55. Sunday's tie between Championship side Millwall and Premier League Brighton (14:00) is also live on BBC One. The draw for the semi-finals, which will take place at Wembley on the weekend of 6-7 April, will be live on BBC One after the Millwall match. Find out the full BBC schedule by clicking here. Benteke is a goal-shy striker and that has been the difference between the two sides - Andre Gray has come on and scored. The better team has won. They showed more composure. Palace huffed and puffed in the first half, they came out brightly in the second half but weren't able to establish themselves. When they needed the extra edge, Watford did it early enough and Javi Gracia deserves credit. 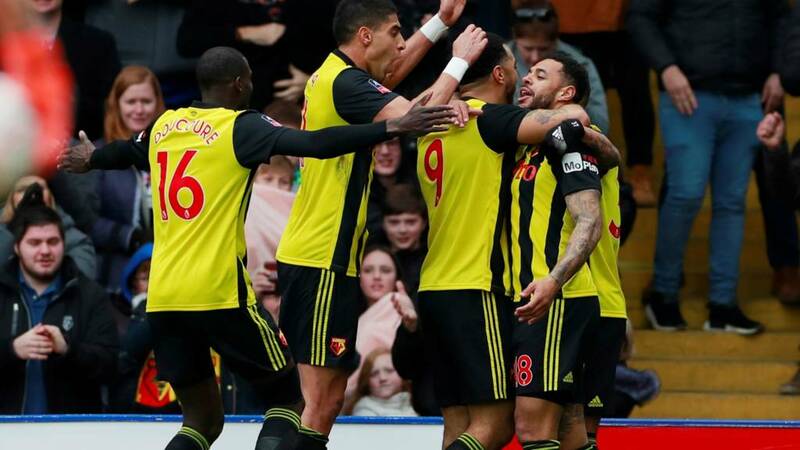 Heurelho Gomes is in tears on the pitch - the Watford keeper retires at the end of the season, and if he only plays in the cup from here this will have been his final appearance at Vicarage Road. He does a tour of the pitch to applaud the home fans, and then stops for handshakes and hugs with some in the corner. Gutsy stuff from Watford after Palace had clawed their way back into it, and what a substitution!